The multi-purpose Parameters window provides access to all available parameters of the selected material. Via this window, you can change a name of the selected material, set up its transparency, rendering into the viewport, rendering of shadows, specify states, textures, and parameters of the material. Only user materials can be modified via this window. Settings of base and manual materials are read-only. All changes to materials are saved automatically as you make them. As well as for nodes, UnigineEditor allows multi-selection editing for materials. 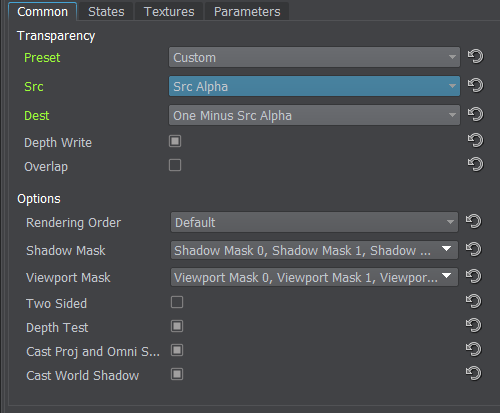 Select several materials in the Materials Hierarchy window and tweak the required settings. For example, you can specify transparency options for several materials at once and then adjust other settings of each particular material (e.g., specify albedo color, roughness, transparency multiplier and so on). 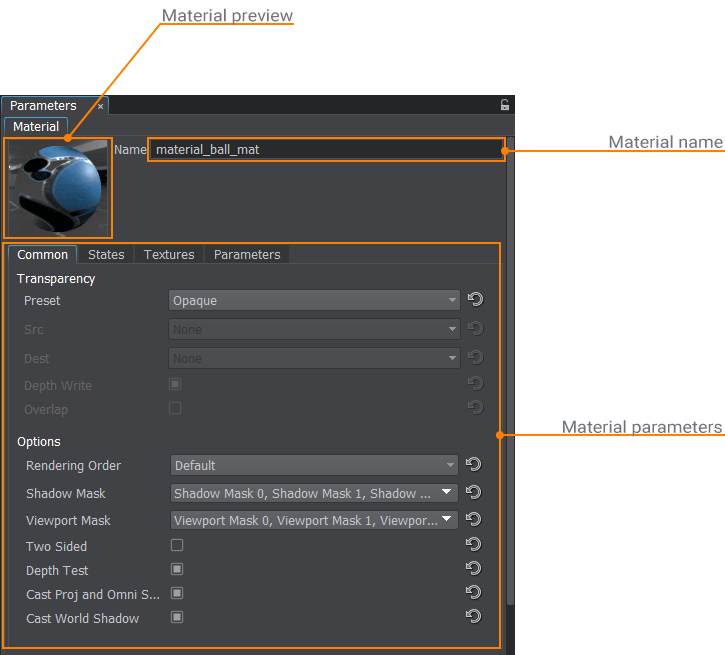 The selected user materials inherited from the different base materials can also be edited: only settings that are common for all the selected materials will be visible in the Parameters window. The selected material is shown as applied to a sphere in the Preview Panel. You can rotate the sphere with a mouse, holding the left button pressed, and scale it with the mouse wheel. The selected material is also previewed in the Asset Browser. A name of the selected material is displayed to the left of the Preview Panel. It is editable, so you can rename the material. The Common tab contains common material settings. These settings are the same for almost all materials except the water_global_base and water_mesh_base ones. The water-related materials don't require transparency settings as water is always rendered as a transparent object. Option used to scale the source color (the color of an overlaying material). Available only when Custom preset is selected. Option used to scale the destination color (the color of an obscured material). Available only when Custom preset is selected. Toggles writing in the depth buffer for the material on and off. This option can be used for transparent objects to prevent them from obstructing the others. With this option enabled the inner part of a transparent object won't be rendered if the outside surface was rendered first. The same can happen to a concave object. Render polygons, to which the material is applied, on the top of the render. This can be used for UI elements. Sort order used when rendering transparent objects (objects that are assigned materials with the Alpha Blend, Additive, and Multiplicative presets). Objects with the lowest order numbers are rendered first, and objects with the highest order numbers are rendered last. Polygon offset level used for the material. This parameter is used to eliminate z-fighting for distant objects in cases of insufficient depth buffer resolution. A shadow mask of the material. A surface, having this material assigned, casts shadows from a light source, if its surface and material shadow masks match the light mask of a light source (one bit at least). A viewport mask of the material. A surface, having this material assigned, is rendered into a viewport, if its surface and material viewport masks match the viewport mask of the camera (one bit at least). Render polygons, to which the material is applied, two times per lighting pass. The option should be disabled to gain performance, if there is no need to render both sides of the polygons. Toggle depth testing for the material on and off. This can be used to make the object visible, when occluded by other objects (e.g. a character behind a wall). Render polygons, to which the material is applied, casting shadows from omni and projected light sources. Render polygons, to which the material is applied, casting shadows from world light sources. The States tab contains a set of flags that are used for a shader corresponding to the material. A set of states can differ depending on the base material. States define a set of textures and parameters of the material. Detailed descriptions of states for each particular material are available in the corresponding article of the Built-In Base Materials section. 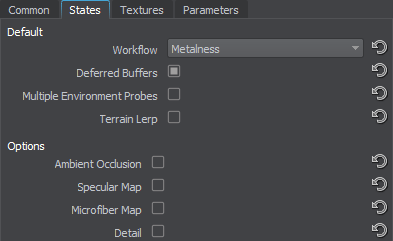 The Textures tab contains paths to textures used by the material. A set of textures can differ depending on the base material and the states enabled for the selected material. Detailed descriptions of textures for each particular material are available in the corresponding article of the Built-In Base Materials section. The Parameters tab contains parameters associated with the available states. A set of parameters can differ depending on the base material and states enabled for the selected material. Detailed description of parameters for each particular material is available in the corresponding article of the Built-In Base Materials section.